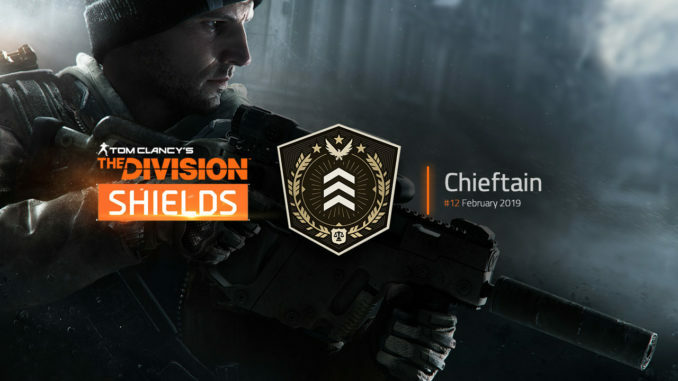 Besides the start of The Division 2’s Private Beta earlier this day, the twelfth and last The Division Shield called “Chieftain” has been enabled now and can be unlocked in-game. The last Shield requires players to fully optimize their gear to the maximum Gear Score of 290 (although the cap is at 291) by using the Recalibration Station and Division Tech. Completing Shields gives rewards in The Division in form of caches and vanity patches and will also reward players who are continuing in The Division 2 with a unique weapon skin, an outfit/vanity patch, emotes, a backpack dye as well as a backpack trophy, depending on how many Shields (Reward Tiers) have been completed. Achieve the highest possible optimized Gear Score 290. In case the Shield doesn’t get automatically unlocked, try to switch out one of the gear pieces in the inventory and re-equip it to reach the maximum again. For more information about the Shields program, check out the introduction here or the video down below, which shows all Shield objectives, recordings, and the reward tiers.